Termination has 0.83 to 1.53-in insulation O.D. 3M™ Cold Shrink QT-III 7620-T & 7690-T Series Termination Kit includes 3 non-skirted, 1-piece, 3-phase terminations. It ensures a pliable, tight seal for tape shield, wire shield and UniShield® power cables. The conjunction of high dielectric-constant material and sealing compounds allows the termination to withstand voltages of 5 to 35kV. 3M™ Cold Shrink QT-III 7620-T & 7690-T Series Termination Kit is designed for terminating solid dielectric-shielded, medium voltage cables. 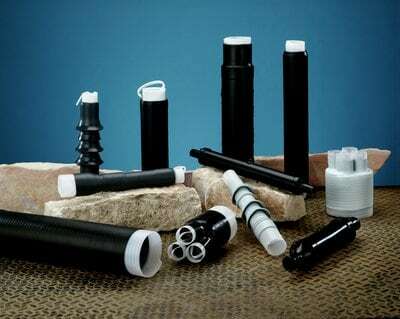 The UV stable, track-resistant, silicone rubber insulation of the termination has a hydrophobic property and offers a long-lasting service life. The lower surface stress, high dielectric-constant material offers an optimized BIL performance while ensuring a leak-proof, compact fit. IEEE Standard 48 Class 1 Approved for indoor and weather-protected applications.